Lifesize and just a bit overwhelming…. Lipstick’s face is kiss free..
Each one I find I fall more in love…. There are sixty of these gorillas altogether. 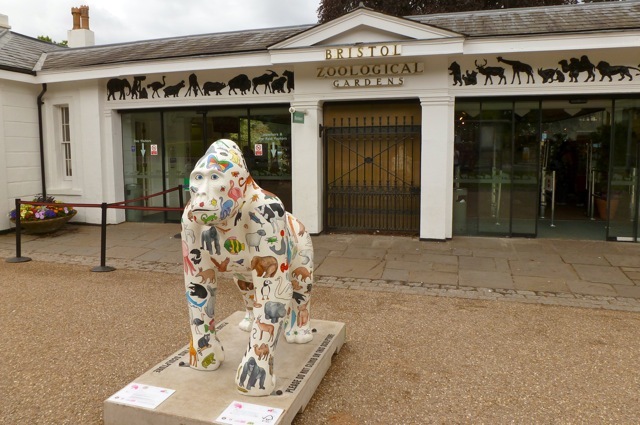 The furthest away is at Birmingham Coach station but the vast majority are to be found in Bristol this summer as part of Bristol Zoological Gardens 175th birthday celebrations. The gorillas have their own face book page and I am going to be on the lookout, might even go out hunting to see how many I can find over the next ten weeks or so. I think I’ll put them on a page rather than drive you all mad posting pictures, but I couldn’t resist posting this right now. I think they are fabulous and I am going to donate £1 to the Zoo fund for each one I find. There is a map showing where they all are here. If you are in the area this summer and happen to see one, let me know. 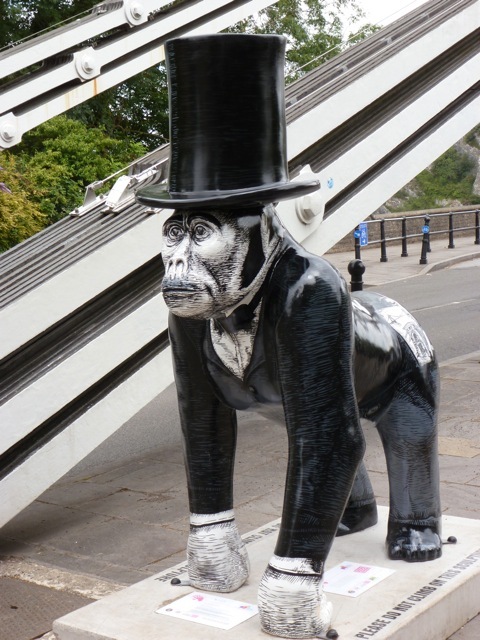 My favourite so far is Gorisambard, just too cool for words with his sideburns. Hello, I am pleased that you like the video. Yes, no problem with the link embedded in your blog. I have just seen your blog. I like the one about the lime trees and madeleines. Very nice, and I love the Iittala china with the dragonflies – we’ve just bought some ourselves. I can see you are Bristol based, so are we. We are into videography, documentary and photography, having done a lot with hot air balloons and the Gordon Bennett Balloon race over the last few years. We are into anything that moves and lots of stills photography and of course Bristol is a great place for all the action. Love the baking by the way. This entry was posted in Bristol, Wow! Gorillas and tagged Bristol, Bristol Zoological Gardens, Wow Gorillas on 07/07/2011 by Joanna. The coolest thing ever! Loved the video, particularly the look of the parent to the two misbehaving “kids” – priceless! Hi Sally I don’t know if the statues are cool, but they are very photogenic and anything that raises awareness of the plight of our fellow travellers can only be a good thing. When we were on holiday in Vancouver a few years ago, there were polar bear statues dotted about everywhere, and in Halifax (Canada) last year there were dolphins – it was fun looking out for them, and reading about what the style of decoration meant to the artist! Maybe it’s a worldwide movement, decorating cities with totemic animals like these. I would have loved to have seen the bears and the dolphins Suelle! 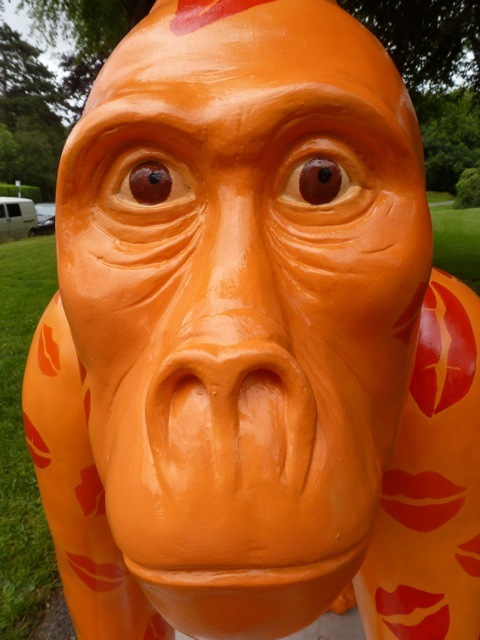 Look out for our lions in Bournemouth this summer and also, historically we did penguins in Liverpool, lions in Northampton and Nairobi, elephants in Norwich, rhinos in Chester, hippos in Rutland, toads in Hull, Superlambananas in Liverpool and soon rhinos in Sao Poalo and lions in Cape Town. We also have another couple of exciting projects in the UK next year but I cant say what yet! Looking out for gorillas is not a normal summer past time- and yet you do it with such panache.And donating a pound for each gorilla- so clever and generous. Is Zeb interested in the gorillas? Or does he just yawn and lift- well- you know what I mean. Love them! I seem to remember there being cows all over the place a few years ago. I’m sure they were promoting awareness of something, but I’ve forgotten what…. hee hee – don’t know who was kissing the orange one though…. Marilyn Munro? Brian knows all about Brunel, the short man with the big hat, (as he volunteers on the SS Great Britain) he came in, squinted at the pic and said “Do you know where that was taken?” Apparently London and the chains are from the Great Eastern another of Brunel’s boats (too much info eh?) – our biggest tourist attraction after the zoo! Hmm, gorilla’s – interesting. I’m a bit jealous that you have real ones in your zoo – we don’t have them here in Adelaide. I bet you have animals in Adelaide that we don’t have here though. Australia’s animals are very special! It is a bit like the buddy bears that travel about. I saw the in Helsinki, but I think they have travelled quite a bit. I love the video, you could watch these amazing animals all day. 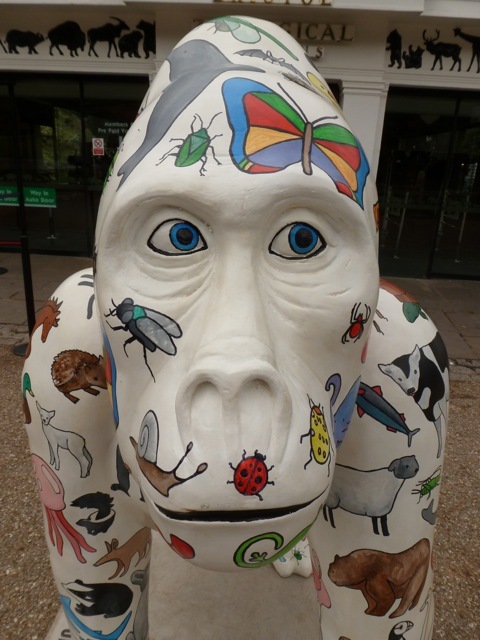 The gorillas will be auctioned at the end of the summer as part of the fund raising process. Proceeds going to gorilla conservation projects and the Wallace and Gromit Grand Appeal. W and G are made here too! Last year we had a similar phenomenon here, but with horses. Lexington hosted the 2010 World Equestrian Games and there were decorated horses everywhere. It was indeed very fun to drive around and point out our favorite horses. I dunno, I think Lipstick is kinda cute. Is that a green kiss on his side that I see? I’m going to look those up too…. Oh Wow! Horse Mania 2010. They are beautiful Mel! 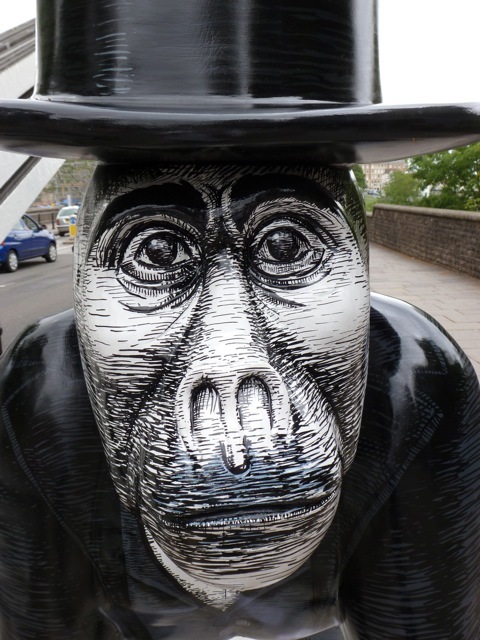 Gorisambard looks so sad; I like Noah – he’s got a lovely sheepish look – maybe he’s the one planting the kisses on Lipstick:) The animatronics Gorilla looked so real I don’t think I’d be sticking around to ask questions – and I’d be hoping it couldn’t sprint too! and elephants in London last year?! Oh, I just love these. We had similar styles of art, though the animal was a mule, here in a small county city in TN. (There is a “mule festival” every April. ) I’ve seen cows, pigs, fish, and other critters all over the midwest USA. I’ve already sent the info to my daughter and family who just moved to the UK. My 2 year old granddaughter will go “bananas”. Mule Day! I just had to go and look that one up right away :) / Hey that looks like great fun too :) I hope your family are happy here, you must miss them, are you going to come and visit soon? Mule Day is hilarious for such an ornery animal. I do miss the “kids” — we will be visiting in September. I think that’s great you are taking your starter with you :) Depends where you will be staying I guess on what the local flours will be. Here is a link to a map showing all the working water and wind mills in the UK where they mill flour still. Also a link to the Cornmillers Guild which has more information. I buy a lot of flour milled at Shipton Mill. I am very keen to try some of the heritage flours being produced in Oxfordshire but I haven’t had the opportunity yet. I’ve seen similar projects in a few different Cities, but they seem to be more popular here than anywhere else. Also – I have seen parts of Bristol that I would never have seen.